If you’re stuck on the side of the road, you’re looking to get help quickly from someone you can trust. Look no further than Always Towing & Recovery. Even if you’re not in a hurry, our trained technicians will be sure to provide the fastest roadside assistance in the Iowa City & Johnson County area! 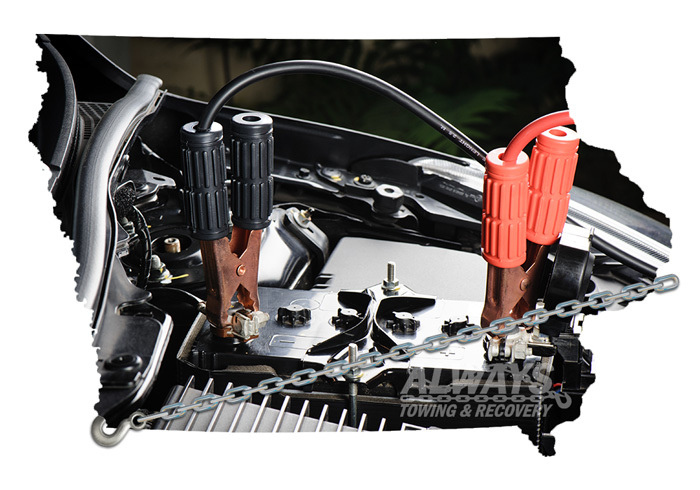 Always Towing & Recovery brings the same level of service to every call, whether it’s a jump start or a tire change. We ensure quality roadside assistance when you need it the most! So if you’re stranded because you locked your keys in your car, have a dead battery, or ran out of gas, we’re Always just a phone call away! Call Always Towing & Recovery for Roadside Assistance! Did you leave your lights on, and now your car won’t start? Is your battery old and needs a boost? We’ve got you covered! Whether you ran over a nail or hit a curb or a pothole, our team is ready to get your tire changed so you can get where you’re going. Accidentally forgot to fill up your tank? Give us a call and our friendly drivers will head out to deliver some fuel to get you back on the road! We’ve all been there at least once. Your keys are locked inside your car, and you don’t have a spare. No problem, call Always!